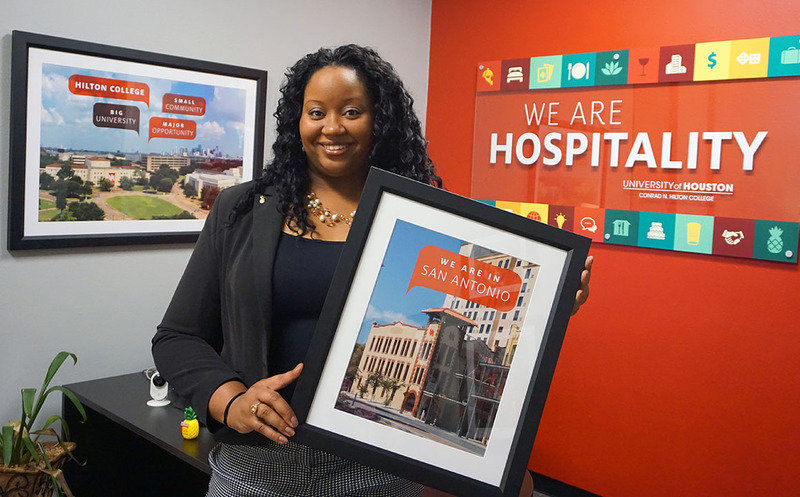 Since joining Hilton College-San Antonio this January, Assistant Dean Ashli Johnson has infused our Alamo City program with an invigorating energy that aims to take enrollment levels to new heights. She’s also committed to strengthening the College’s relationships with the area’s top employers. Hilton College-San Antonio opened its doors in 2014 to become the city’s first provider of a bachelor’s degree in hotel and restaurant management. The program allows students from San Antonio and the surrounding areas to take classes close to home with the full benefit of receiving their degree from the University of Houston. Before joining the College, Ms. Johnson held teaching and advising roles at University of Central Florida’s Rosen College of Hospitality Management. One of her favorite parts of that position was connecting students with recruiters and talent acquisition professionals. She also has extensive experience in human resources and training at the corporate level, as well as a master’s degree in hospitality and tourism management with a concentration in hotel investments from Florida International University. Two weeks after learning she had gotten the job, Ms. Johnson packed her bags and boarded a plane to Texas. By the time she was a freshman in high school, Ms. Johnson had already lived in Japan and Germany, and a handful of cities across the United States. In fact, it was discovering new locales and staying in hotels during her youth that sparked her interest in hospitality. Living among different cultures also gave her a true appreciation for diversity. With her first semester in San Antonio in full swing, Ms. Johnson is building upon initiatives that will – among other things – display the very best of what the program has to offer potential students, community and corporate partners.